This week’s “how to” article highlights one of the four Questionmark Analytics reports specific to course evaluation, now available in Questionmark OnDemand. 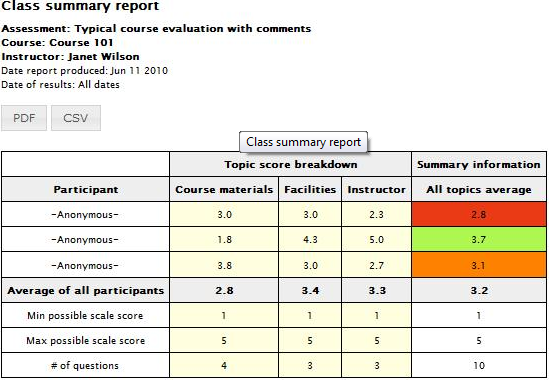 What it does: Compares course evaluation feedback for a single instructor for a single course. Who should use it: This report is ideal for managers and learning/education/training professionals who need to gauge the reactions of participants in specific class, as well as for instructors looking for direct feedback to improve future learning experience. Summary Table of Statistics: provides detailed information regarding the Course Evaluation results obtained for each of the participants in a course for an instructor as well as summary information for all participants in a course for an instructor. All Topics Summary Graph, which plots the average ratings across all topics in the survey for all participants combined. The report also provides average results for each individual participant. 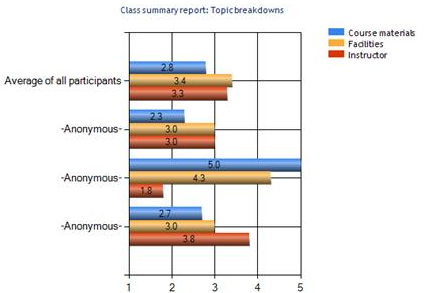 Topic Breakdown Graph, which plots the average ratings for each topic in the survey for all participants combined, and provides the same topic-breakdown analysis for each individual participant.